UFC 125: Resolution features an incredible cast of UFC performers. 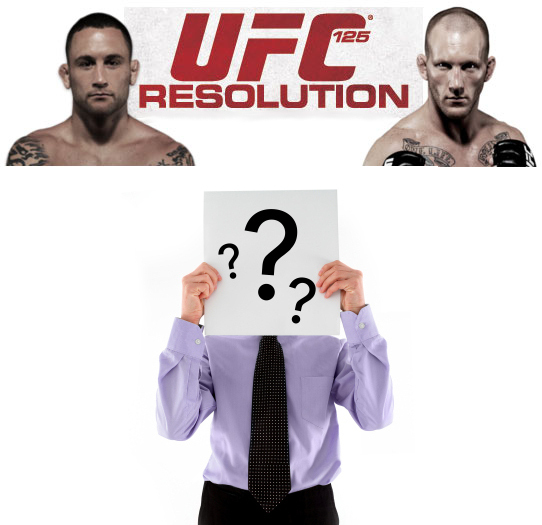 But before anything else, Fighting Insider pondered on who's arm will be raised on the upcoming UFC 125: Resolution. Christmas is all over, and year 2010 will end in just a couple of days. Here at Fighting Insider, we know that fans are planning to welcome 2011 with a bang. Audience and viewers will definitely feel the explosion at MGM Grand Garden Arena, as Frankie Edgar brings his Lightweight championship belt on the line. That being said, Fighting Insider will be giving its fearless forecast on the UFC 125 main card. Though Takanori Gomi swings hammers whenever he throws his punches, it is possible that Clay Guida is aware of it. Guida is well-rounded enough to bag a unanimous decision win from this event, depending on the mentality that he’ll bring. But if he’ll strike for whatever reason, Gomi will definitely land something huge on him, and it might result to Technical Knock Out or Knock Out. This fight will focus on how Nate Diaz evolved during his stay under the UFC banner. And despite being a dark horse for the title shot, he will probably land a TKO on round two or three against Don Hyun Kim. It’s been a long and rocky road for Brandon Vera. This time, one more loss and he will have his three-fight losing streak. And it is a general notion that a three-fight losing streak makes a fighter expendable from UFC. Unfortunately, it seems like Thiago Silva is too much for Brandon Vera to take. Simply put, Thiago Silva will win by unanimous decision. Brian Stann is a step backwards compared to the talent that Chris Leben has been executing lately. However, Stann’s ambidextrous and powerful arms is something for Leben to worry about. That being said, a loss to Stann can be the worst thing that can happen to him, since Anderson Silva pound his face during his UFC debut. But despite all that pressure, The Crippler will probably land a KO in round one. This is the most difficult match-up to predict! Frankie Edgar was able to beat BJ Penn twice. And fans know very well that BJ Penn is one tough fighter. On the other hand, Gray Maynard is an unbeaten contender. And taking both matters at hand into consideration, the UFC 125: Resolution is definitely going to be a war. Both fighters will go five rounds, and audience can expect big takedowns, slams and striking at an amazing pace. But if Maynard didn’t show up in a monster form, Edgar’s uncanny cardio can be his best ally and it might help him land a unanimous decision. Got your own UFC 125 prediction? Share it by leaving a comment.